Samsung detailed its plans for its 2014 TV lineup earlier this year at CES 2014, but the company has kept pricing and availability details tightly under wraps until now. At a home-entertainment exhibition held today at the Guggenheim Museum in New York City, Samsung set its biggest, brightest and curviest televisions on display among the likes of some of the world’s greatest art. The list of models, availability dates and pricing is extensive this year, so we’ve broken it all down below. All of Samsung’s UHD televisions this year support the latest standards, including HDMI 2.0, HDCP 2.2, MHL 3.0, and HEVC (H.265) video-file decoding. In addition, Samsung says all of the sets in its UHD line will be powered by the company’s “One Connect” box, which houses the television’s inputs, outputs and “brains,” if you will, inside a set-top box rather than in the TV itself. This allows the displays to be a little thinner, but more notably, this approach turns the display into a dumb panel, allowing the TV to be upgraded in the future by swapping out the One Connect box. Samsung refers to this as a UHD evolution kit. Headlining Samsung’s aggressive push into curved UHD displays is its absolutely monstrous 105-inch TV. The display stands out from the rest not only due to its size, but also because of its cinematic 21:9 aspect ratio and resulting 11 million pixels. Its important to note that with such a wide screen shape, the normal 16:9 HD content we watch on a daily basis will be displayed with black bars on the right and left sides, though the enhanced width will look fantastic for movies shot in wider formats. Samsung hasn’t yet disclosed the pricing on this monster just yet, but we’re expecting the number will be as massive as the TV and will update this article as soon as we know more. While the 105-inch model may be the big daddy of the bunch, the U9000 series is, for all practical purposes, the real flagship line for Samsung this year. Expect 55-, 65- and 75-inch models – all curved – this year, priced at $4,000, $5,000, and $8,000 respectively. As the top-tier series, the U9000 series will pack Samsung’s best processing, including a new proprietary “Auto Depth Enhancer,” which adjusts contrast in specific ares in an effort to impart a deeper, 3-D-like feel without out the complication of glasses or any of the drawbacks of conventional 3-D processing. The series also features Samsung’s best brightness enhancements. All of the TVs will be wall-mountable using conventional VESA standard hardware. Just a small step down from the top of the line, this series will offer just two sizes. Expect a 55-inch and 65-inch model, but you’ll need to wait on pricing as Samsung is still figuring that out, apparently. We’ll update this section as soon as Samsung makes up its mind. We do know that this series will offer local dimming, and this series’ bezels and profiles are ultra thin – 7 mm for the bezel and 1.2 inches thick. Looking at the line, you’d never know it wasn’t Samsung’s top-tier series. If you want a flat UHD TV, you’ll eventually have five sizes to choose from. Samsung is releasing a 55-inch flat model for $3,000 and a 65 incher for $4,000 later this month, then plans to follow up with $2,500 50-inch, $3,500 60-inch and $6,000 75-inch options in May. These models will offer a slightly less elaborate local-dimming technology for better contrast and black levels, but its still local dimming, and that’s a good thing. We’re excited to see edge lighting, which can cause brightness uniformity problems, used less and less. Surprise! 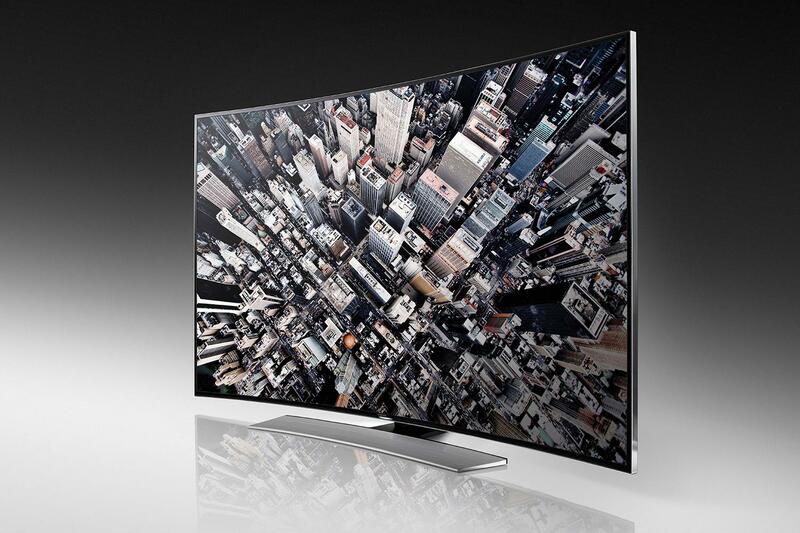 Samsung’s best 1080p TV is also a curved TV. The series will launch “this spring” with a 55- and 65-inch model available for $2,500 and $3,400, respectively, placing them dangerously close to their flat UHD counterparts in terms of price. In may, Samsung will follow up with a 48-inch model, priced at $2,000. 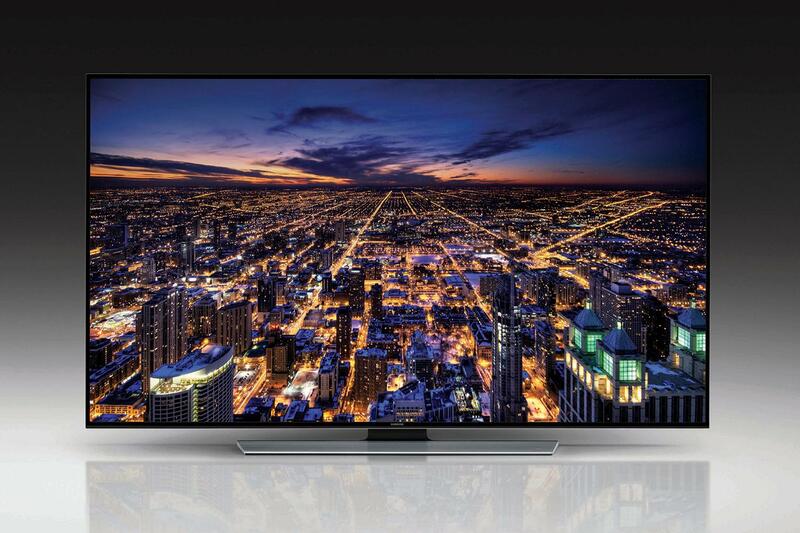 This will be Samsung’s best flat LED TV series for the year. The company plans a Springtime roll-out of four models, including a 55-inch model for $1,900, a 60-incher for $2,200, 65-inch option for $2,700 and 75-inch TV for $4,000. This series will boast all of Samsung’s best processing and backlighting technology, as well as a quad-core processor for snappy navigation and Smart TV access. Samsung also says users will be able to stream content on the TV directly to their mobile devices. We’ll get more information on that feature later today and report back. That’s it for Samsung’s top-tier TV lineup. What do you think of the options and pricing for 2014? Leave your comments below, and visit back soon for a close look and video coverage of today’s event.